There are plenty of things wrong with the United States and every other country in the world, but I don’t know of any other country that is so ignorant and violent and alarmist and controlling and deadly than that of China, though all of Asia in general is pretty much guilty of this, as well. Once again, they are in the news with their reactionary, idiotic violence as a means to control a population, and propagate Fear. 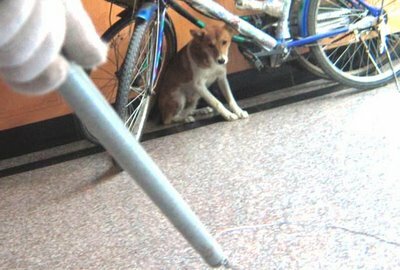 Apparently, yet another government-imposed fear over (so-called) Rabies has driven the Chinese government to kill every, single dog within the County of Mouding over a 5 day period by beating them to death, even taking them from owners as they walked their dogs and beating them to death on the spot in front of them. The residents were offered the equivalent of 60-something cents if the family would kill their own dog before authorities arrived. For those who tried to save their dogs, the authorities would sneak into the town in ways that would cause dogs to bark as an alert, and then that dog would be killed. Of course, the POLICE and MILITARY dogs were spared. This isn’t the first time there has been a massive slaughter of dogs in China… in preparation for the Olympics being held in Beijing in 2008, over 40,000 dogs were killed as the fantastical rabies scare was strategically imposed by the government as a front for monstrous Mao Tse Tung’s declaration that the ownership of a dog is a symbol of “bourgeoisie,” since caring for a dog reeks of American freedoms. As usual, as with almost every other mythical virus or disease scare, it is almost always a front for a completely unrelated agenda. This also, from a country who imprisons THOUSANDS of Human Beings because it is against the law to practice their chosen spirituality (Falun Gong) and then using these prisoners as enslaved workers, and HARVESTING THEIR ORGANS WHILE THEY ARE STILL ALIVE to be used for the wealthy who can pay for it! In fact, if you took part in the traveling exhibition called BODIES, where the bodies were mummified in a way that preserved all of the organs for entertainment and observation, you took part in their making a profit from using innocent people WHO WERE KILLED ONLY for use in those exhibits! There are links, above, for help in what we can do for the Humans being exploited in China, and here is a great site for helping Asia, in general, extend their circle of compassion to include non-human animals. I have to take heart in the fact that the world IS getting better at experiencing compassion for other humans and non-humans, but we also have a long way to go. Previous PostEverybody Needs Some Help, SometimeNext PostAre you a Sheep, too?